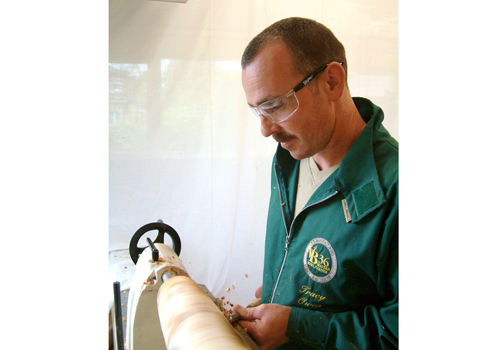 Axminster Tools & Machinery's Warrington store is hosting 'Woodturning with Tracy Owen' on Saturday 30 November. On the day Tracy will be covering techniques such as texturing with Arbortech tools and ebonising. Although Tracy works mainly in ash, elm and sycamore, he will demonstrate how to turn goblets and finial box forms from yew, and how to make square bowls. Tracy, who is well known within woodturning circles, specialises in green or wet woodturning of bowls and hollow forms to create unique one-off pieces. Tracy's trademark bowls in native timbers are supplied to some of the most prestigious retail outlets and designer kitchenware suppliers in the UK. The event, starting at 10am and ending at 4pm, is likely to be popular. Anyone interested in seeing Tracy in action would be wise to get there early. More information can be found here here.